1. The heart of Paris is burning. Notre Dame, the 12th century cathedral at the centre of Paris, is burning down. The fire broke out around 6:50 p.m. local time. An hour later, the iconic wood and lead spire had collapsed. “Like all of our fellow citizens, I am sad tonight to see this part of us burn,” President Macron said on Twitter. The cathedral was under restoration when the fire broke out. Chief firefighters have reported that the main structure may be saved. See all our coverage here. 2. Over in markets. Citigroup, Goldman Sachs, Wells Fargo and JP Morgan have rallied this quarter, but positive earnings reports coming out of the US did little to buoy markets overall. There’s some hope for global trade with Chinese exports rising 14% YOY in March, still not fully recovered from a sharp drop in February. 3. SPOILER ALERT: A breakdown of the details you might have missed from Game of Thrones season 8 premiere. The first episode garnered an impressive 17.4 million viewers on HBO. If you’re one of the few who haven’t watched it and you don’t want spoilers, do NOT click this link. 4. 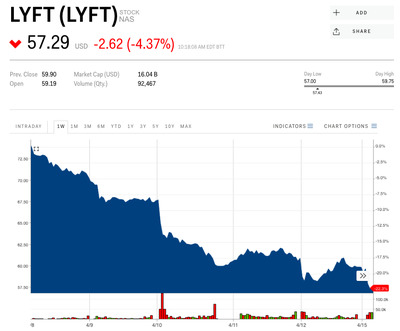 Failure to Lyft off. The share price of the newly listed Lyft is tanking, trading at just over $US57 – 35% below their IPO pricing on the Nasdaq. And it’s not just Uber that is to blame. 5. Centre for spying. Ecuadorean President Moreno has told media that Wikileaks founder Julian Assange was trying to use the Embassy as a base to “interfere” with other countries. “This activity violates asylum conditions. Our decision is not arbitrary but is based on international law,” Moreno said. WikiLeaks has denied these claims. 6. Phabulous. Our reporters have gotten their hands on the Samsung Galaxy Fold – the new folding smartphone tablet (“phablet” apparently). Here’s our review on everything it has to offer from the six cameras, split screen mode and the fold itself. The phone is due out in the US on April 26. We are still waiting for local pricing and release date. 7. Confidence crushed. The instability in the UK is causing serious financial losses to the economy. A new report has shown that the UK is set to be the only large advanced economy to see a drop in productivity growth in 2019. Another report directly blames Brexit, saying that “[it’s] virtually impossible for businesses to grow here”. 8. Very superstitious. A blog has been fined AU$42,000 for making slanderous comments about the feng shui of a property development in China. The comments about the building looking like “pig’s kidneys” and having a “bad feng shui layout” were found to be highly damaging to the developer and architect. 9. Facebook’s Easter came early. Tens of thousands of Facebook-owned, virtual-reality controllers have hidden messages in them, but not the fun kind. Developers accidentally left code in the system from the prototype, such as “Big Brother is watching” and “This space for rent”. Probably the most honest sentiment to come out of Facebook in a while. 10. Plea for our oceans. The President of the Seychelles has reportedly conducted the first underwater broadcast from a depth of 124 metres. The speech was an effort to bring much needed attention to the state of the oceans. “At this depth I can see not only the incredible beauty of our ocean, but the care that it urgently needs to stay this way,” he said. The cast were just as excited as the rest of us about the Game of Thrones premiere. For some of the cast, filming for season one began in 2010. This final season has been a long time coming.